See how to get your Amazon Echo hooked up to your Salesforce account and what problems have yet to be solved. I've been tinkering with Amazon's Echo and the corresponding Alexa services since mine arrived slightly before Dreamforce. It became the cornerstone of my most complicated demo ever. However, I have shied away from sharing too much real code because I've never really been happy with the way authentication worked against the Salesforce API's. The most reliable way was to setup an API user that could make the request with a stored username/password. While that isn't unusual for an integration like this, it lacks the personal touch of a user being able to link their Salesforce account with their Echo. Amazon has been slowly upping their game in this department. First, they added account linking in general, and then they added a more complete OAuth flow, which includes both an access and refresh token. This allows a user to link their account once and keep accessing the API until the tokens are revoked. After a couple of hoops, I think I have it working. Here's what I did. Note: When I took that screenshot, it worked fine. Mysteriously, it stopped adding the redirect URI. 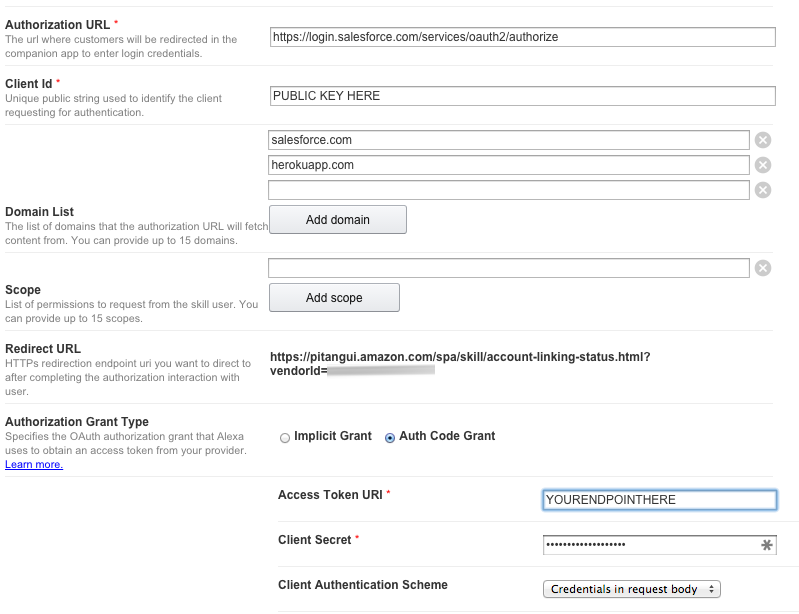 If that happens to you can just add it to the Authorization URL (just append "?redirect_uri=https://pitangui.amazon.com.etc"). Amazon's request is a bit non-standard. It doesn't seem to include a Content-Type header, and it seems to be in JSON and not form-encoded. Salesforce's Token URI requires both. The Salesforce response is also a bit non-standard. There doesn't seem to be an expires_in attribute, and we also send over the instance URL because it is required for the API requests. response.expires_in = 5400; //in seconds, set this to be less than your setting under session management. That endpoint is what I put into the token URI in the Amazon setup. Amazon will send along the most recent access token (with our instance URL riding piggy-back). You won't see the refresh token because you don't need it. Amazon will request a new access token via the same endpoint in an interval as defined by expires_in. So in my case, it grabs one every 90 minutes to be sure it beats the two-hour session timeout. One thing to note: I cannot log into Salesforce using the Alexa app. I don't know why, I'm trying to get a conversation with Amazon going about it. It does work from a desktop browser though (http://echo.amazon.com). Keep your eyes here on a more mature version of this solution. Published at DZone with permission of Josh Birk , DZone MVB. See the original article here.